This Norfolk Broads Cruiser Houseboat is now available for sale with residential mooring at South Dock Marina in SE London. 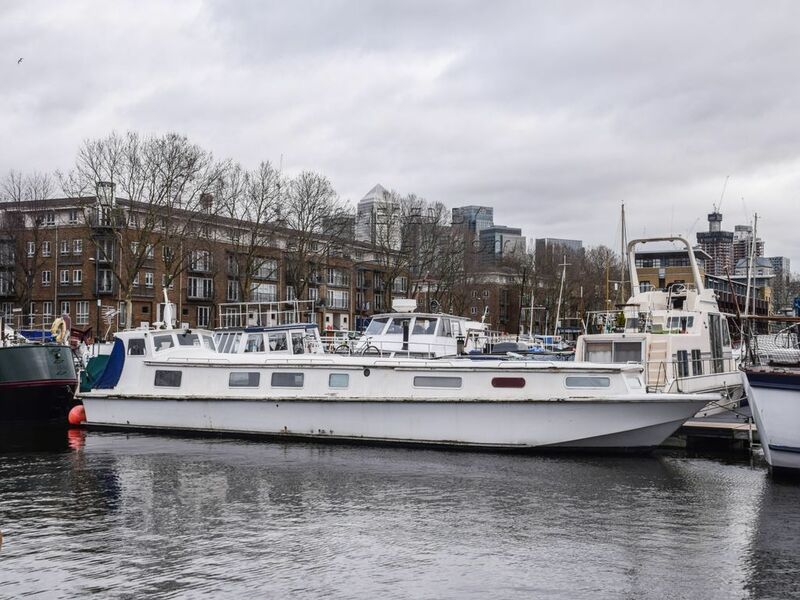 Built in circa 1970 this GRP boat has been used as a houseboat for a number of years and comes with a mooring in one of the most desirable marinas in London. It has two cabins, bathroom with shower and open plan galley and living area. The twin diesels produce a combined 84HP and are both running well as the owner keeps them regularly serviced and maintained. They both have new alternators and starter motors fitted. South Dock Marina is a peaceful community of boaters with great transport links to central London. Canary Wharf is a 5 minute river bus trip away from Greenland Pier and Surrey Quays (10 mins) and Canada Water (20 mins) are both within walking distance of the boat. Current mooring fees are £8,880 p.a. and the marina will charge a 10% transfer fee (of the sale price) on changing over the mooring to the new owner. This Wide Beam 52ft With London Mooring has been personally photographed and viewed by Angus Rose of Boatshed London. Click here for contact details.